Tuffa Dubs records are proud to present their very first Artist EP, featuring our long time brethren from London city El Fata. Since the very first 7” release named “Tell them again” we have been bringing together our trademark, digital sound with the amazingly sweet and unique vocals of the highly talented and unmistakable El Fata. We have been working hard in the studio and live on stage perfecting our cool and deadly combination which has been tried and tested in many of Europe’s biggest dancehall sessions. “ Dancehall Style” takes you on a journey through many different styles of digital reggae, including four brand new vocal tracks and two exclusive dub mixes. The opening track of the EP is named “Revolution Time” . El Fata delivers a message of consciousness and positivity in this time of uncertainty for many. The riddim has a real dubwise feel and is sure to push any bass speaker to the limit . The following track is “Revolution Time Dub” a dubbed out instrumental version guaranteed to nice up the roots dance and mash down the walls of Babylon. Last up on side A is “Super Lover”. 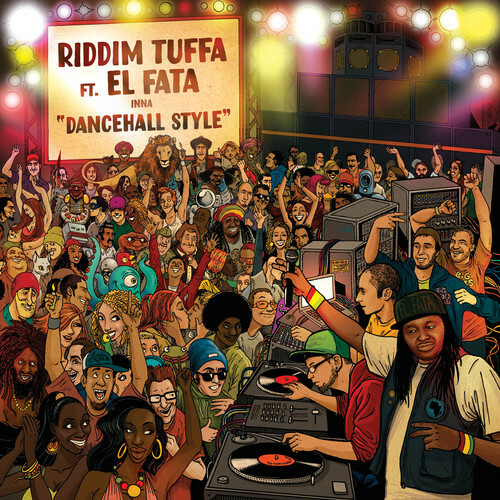 El fata drops some beautifully laid back vocals on top of our high energy digital casio riddim giving the track a unique and exciting feel to get any dancehall rocking and all the ladies dancing. First up on side B is a new take on our previously released “Inspector Gadget” riddim, made famous by King Generals hit tune “Digikal”. El Fata smashes the “Dancehall Sweet” track with nothing but pure niceness and good vibes showing the world why he is one of the UK’s hottest and favourite dancehall talents. An earth shaking dub mix follows. Rich in reverb and delay our fresh new mix is set to rock up every party in town. For the grand finale we have laid down our own version of the classic Jah Tubby’s riddim named “Pure Worries” . “Champion sound” is a supercharged dancehall killer for all the soundboys and soundgirls guaranteed to mash up any session from Scotland to Tokyo. The “Dancehall style” EP features amazing hand drawn art work and is now available on 12” Vinyl.